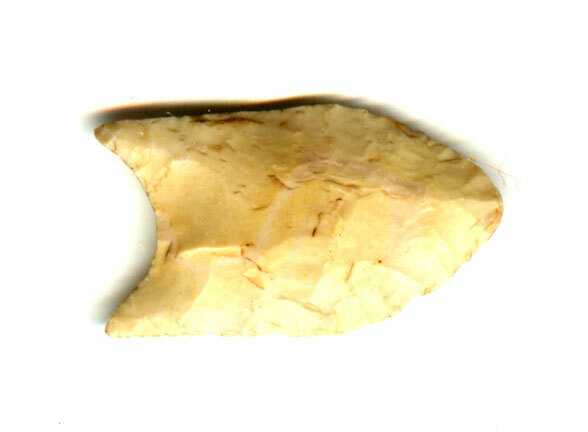 A Small, Normal Size, Well Made, Visibly Aged And Anciently Use Sharpened, Barnes Fluted Point That Exhibits Surface Aging Coloration And Overall Stone Patination, Aged Surface Mineral Deposits, Correct Rolled Basal Stem Edge Hafting Dulling, Correct Blade Sharpening Use Reduction, Correct Early Style Flaking, Correct Material And Manufacture For The Area Found. Found By Perry Lynn Cude Sr. Ex-Perry Cude Sr. And R.W. "Dub" Lyerly Collections. The Type Is Listed In Perino Vol. II, On Page 17, Having Clovis And Folsom Characteristics And Found Along The Mississippi Into N.E. Arkansas! Includes Dwain Rogers ( As A Plainview ) And Ken Partain ( As A Barnes ) Certificates Of Authenticity.